Top Ten Tuesday is a weekly linkup of book bloggers hosted by That Artsy Reader Girl! 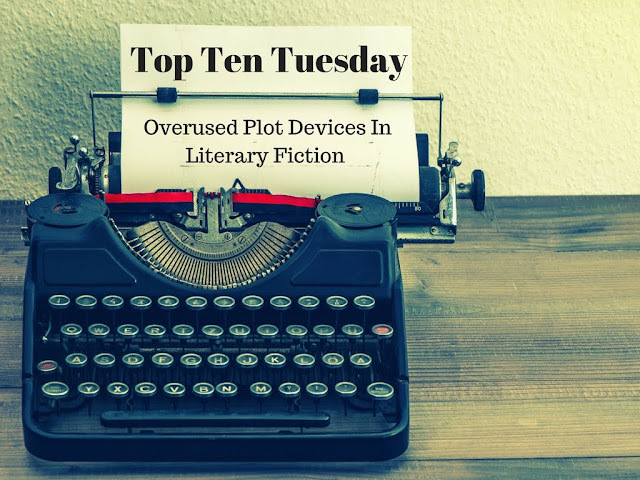 This week's topic is really about overused words in particular genres, but since I don't do a lot of genre reading, I'm twisting it a little bit to highlight plot devices in my most-read genre (literary fiction). All of these are fine on their own and have been a part of works that I love and cherish, but when you read a lot of literary fiction, you read a lot of books with this stuff in it. Male Protagonists: Part of this is because the authorship in this genre skews male, but it seems like women trying to avoid the "chick lit" label center their stories around men, too. Obviously I've read plenty of great stories that focus on guys, but I'd like to see women's stories treated as serious literature too (Jennifer Weiner makes this whole point better than I can). Midlife Crises: It seems like what often kicks off these kinds of books is someone in their 40s starting to re-evaluate their life and choices and despair that they've made the wrong ones. This is rich thematic territory, so it makes sense that it gets used a lot, but there's only so many times you can read about it before it starts to feel tired. Adultery: This goes along with the midlife crisis bit...either our protagonist starts having an affair, or their spouse does, and then there's a bunch of to-divorce-or-not-to-divorce angst and it's actually more interesting if there's just a growing apart or diverging paths. Sensationalized Mental Illness: While about 1 in 5 people will in their lifetime experience a diagnosable mental disorder (most frequently, depression and anxiety), the kind of mental issues that pop up in literary fiction don't tend to be the kind that people routinely go through. It's dramatic (bipolar mania! schizophrenic episode!) and dangerous and almost always someone besides the main character, so that Lessons can be learned. Repression: Inability to express your feelings to the appropriate person at a reasonable time is a bang-up way to ensure that they get expressed badly elsewhere down the road, which is a golden ticket to drama. A Climactic Event: In the popular many-perspectives variety of literary fiction (which I do tend to go for), bringing all of the players together for a final showdown before the denouement kicks in feels inescapable. A Figure From The Past: Maybe it's an old flame that kicks off the Adultery mentioned above. Maybe it's an old friend with a secret. Maybe it's someone relatively minor who serves as a catalyst to stir up the things the hero thought they'd Repressed. But they're out there, just waiting to suddenly re-emerge and tear down the protections our main character has built up. Sibling As Foil: If there is a sibling in a literary fiction book, they're likely someone who serves to reflect the main character's own life back at him (or her, but usually him, because Male Protagonist). Maybe they're the bad kid, who has burdened our hero with the sole weight of parental expectations and had a freedom they've always longed for but also scares them. Maybe they're the good kid that always makes our hero feel second-best and from whom they've always been longing to steal the spotlight. But they're there to be what the main character is not. A Symbol: Maybe it's a literal object, maybe it's a human being. But there's some piece of the book that's not actually what it seems to be, because it's a stand-in for something else. This can be executed well, but is more often heavy-handed. A Dramatic Mistake: Near the end, our protagonist will realize that something they've understood one way for a long time (decades is best) is actually not the way they thought it was at all. This changes everything about what came before. This post is spitting hot fire. Excellent! You want hot takes, I've got em! OMG YES! I spent about 7 years working as an acquisitions editor for a few literary journals. I rejected hundreds of depressed-middle-class-white-dude-has-affair stories. Just . . . no more, please. I’m begging you. Why do dudes think that their wandering dongs are interesting for anyone to read about?